July 26, 2011 - Flight Design will introduce a full-scale mock-up of their new four seat C4 at this year's EAA Air Venture in Oshkosh. As in all previous Flight Design models, a BRS parachute system has been designed for the C4 and will be included as standard equipment on all C4's sold. "It is no coincidence that Flight Design's CTLS and MC LSA models and the Cirrus SR20/22 are the industry's top selling aircraft in their market segments, and that they all include a BRS system as standard equipment, not as an option," stated Boris Popov, founder and director for BRS Aerospace. "The C4 is an attractive new alternative for the pilot who wants to own a state-of-the-art, high wing, composite aircraft together with a truly giant cabin and the excellent visibility that has made the Flight Design CT line of aircraft famous. "It will have fixed gear and a lot of commonality with the CT," said Matthias Betsch, CEO of Germany-based Flight Design GmbH. It will be big and quiet... quite an elegant airplane," he said. The C4 price point for the U.S. market has been established as not-to-exceed $250,000, including the BRS parachute system, with an estimated range of 1,200 nm and a 160 kts cruise speed, according to Betsch. 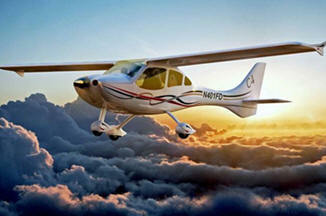 Flight Design's development schedule targets a C4 prototype flying early next year, with EASA and FAA certification by the end of 2012 and production and deliveries starting in 2013. Betsch said C4 buyers will have options for both an avgas/alternate fuel power plant or a Jet A diesel engine, with engine supplier partners to be announced soon. Larry Williams, CEO of BRS Aerospace, adds, "We are especially proud that Flight Design continues to trust us to provide the highest quality emergency parachute systems in the world for their new aircraft. We have enjoyed a solid, mutually-beneficial relationship for many years and this commitment on their part further reinforces and emphasizes our dual strengths in providing the safest possible aircraft." Based in South Saint Paul, Minnesota, BRS Aerospace consists of three divisions: BRS Aviation which designs, manufactures, and distributes whole-aircraft emergency parachute systems for general aviation and recreational aircraft; BRS Defense which designs and manufactures a variety of parachute systems for US Department of Defense and foreign military customers; and BRS Safety which designs and manufactures reflective and load-bearing safety vests, and other apparel. Since 1981, BRS Aerospace has delivered more than 35,000 parachute systems to aircraft owners worldwide, including over 4,700 systems on FAA-certificated aircraft such as the Cessna C-172/182 and new C-162 Skycatcher. To date, BRS Aerospace parachute recovery systems have been credited with saving the lives of 261 pilots and passengers.